We’d love your help. Let us know what’s wrong with this preview of What Your Soul Already Knows by Salma Farook. We live life like automatons, moving with reckless inattentiveness through the preset motions. We have lost touch with our inner selves, the self that has all the answers, that is imbued with the natural balance of joy and productivity. What have we forgotten? What have we lost to this mechanical lifestyle? The secrets to joy, aren’t secrets at all. They aren’t being whisp We live life like automatons, moving with reckless inattentiveness through the preset motions. We have lost touch with our inner selves, the self that has all the answers, that is imbued with the natural balance of joy and productivity. What have we forgotten? What have we lost to this mechanical lifestyle? The secrets to joy, aren’t secrets at all. They aren’t being whispered. You are just not listening loudly enough to the wisdom of your inner voice. This book is a reminder to listen. To ask other readers questions about What Your Soul Already Knows, please sign up. This is an interesting, well-written, inspirational book about how to try to find happiness in normal, everyday life, and the peace and contentment that comes with such realisations. Farook is about to start work as a GP at a Seychelles Hospital and stories from her med school training pepper and enlighten the text. Im not a great fan of this type of book but I cant fault the writing - Farook has a nice poetic touch which bodes well for her upcoming collection of poetry. I think Id have liked a This is an interesting, well-written, inspirational book about how to try to find happiness in normal, everyday life, and the peace and contentment that comes with such realisations. I received the book from the author, Dr Salma Farook and I want to thank her for that. I don't read a lot of self-help, self-development books, but I enjoyed this one (I don't know if the book fits into the category of a self-help book though). Anyway. It's a very short book, everyone can read it in one sitting but I wouldn't recommend that. I think to truly enjoy this book, you need to read only one or two chapters a day. That's it. Because these chapters although short (but have the essentials) I received the book from the author, Dr Salma Farook and I want to thank her for that. I don't read a lot of self-help, self-development books, but I enjoyed this one (I don't know if the book fits into the category of a self-help book though). Anyway. I think to truly enjoy this book, you need to read only one or two chapters a day. That's it. Because these chapters although short (but have the essentials) are enough to make you reflet on every single thing you did in your life. So that's what I did, I read a chapter or two, sometimes three, usually before going to sleep to get my wisdom of the day and then things would pop in my mind, things I did wrong, how I took things for granted, how I should work on this and that (like saying no to people lol). I think what I really like about this book, is that it's not promising us something miraculous from the beginning meaning from the title. This book is just what the title says it is, it's filled with things we all already know, but we need to be reminded of. That's what is beautiful about it. Another detail that made the reading very easy and accessible is the language and style of writing, it's nothing too complicated or heavy because I think the focus of this book is self-reflection, so instead of trying to understand complex syntaxes (English not being my first language) I could focus on my life, my past behaviors and think about how I could change that, and I was constantly reliving my past and analyzing my actions. First of all I want to thank the author Salma Farook for giving me the chance to read and review her book "What Your Soul Already Knows." And holy crap, it was a brilliant read. At this point while I'm writing my review I'm both at a loss for words and wanting to say so much because it's been a while since a book has touch me this deeply. But I shall try my best. So it's not a secret that I love nonfiction. Last year it was my most read genre but I've never actually read this kind of nonfiction. First of all I want to thank the author Salma Farook for giving me the chance to read and review her book "What Your Soul Already Knows." And holy crap, it was a brilliant read. At this point while I'm writing my review I'm both at a loss for words and wanting to say so much because it's been a while since a book has touch me this deeply. But I shall try my best. So it's not a secret that I love nonfiction. Last year it was my most read genre but I've never actually read this kind of nonfiction. On Goodreads it is shelved as self help and I've always thought this kind of nonfiction wouldn't be my thing as I'm mainly interested in nonfiction that deals with history but I guess I was really wrong about that. What Your Soul Already Knows resonated so deeply within me. This is something that happens very rarely and only to special books. I just HAD to give it five stars. One of my favorite parts of the book was the various quotes from famous people at the start of each chapter. I adore quotes and the author collected a lot of good ones, from Hippocrates to Oprah Winfrey. I just loved them! Other than the quotes at the beginning of each chapter, the author's writing is actually also very quoteable. My favorite quotes comes from the chapter called contemplation, which is probably the chapter I loved the most because I somehow felt very connected to it and especially the actually quote, which is this: "The perfection of creation is astounding. Each breath is a celebration of being witness to such eternal splendour. Night shifts to day, and I am awed by the precision of this timeless clock. I am one of 7 billion souls, living on a green planet that flawlessly orbits a ball of fire, next to a moon that moves the seas. How could I not believe in miracles." I also loved this quote, which also is one that speaks for itself: "We are so obsessed about if the cup is half full or half empty, but the important thing is: There's water in the cup; stop complaining and drink it." The chapter called Meditation I thought was also an important one because it's certainly true that sometimes you just have to take a step back, take some rest for yourself and just breathe. A quote from it: "Remember to replenish yourself. You are not the ocean. You are not infinite. But, with regular rejuvenation, you can be." My second favorite chapter next to Contemplation is Refusal because this also resonated with me. I know for myself I have a hard time saying no to people. And I'm sure a lot of other people feel the same and this chapter had a lot of reasons on why we should say no more often even if it's something we think we shouldn't do. Wise, beautiful and eye-opening. Will re-read. This book is pure inspiration. The "mantras" you will find inside will challenge your search for self-discovery. It includes explorations, practical tips, little stories, games and beautiful quotes that challenge you to start doing what you already know you have to do. There's even a financial management topic! It's composed of 26 chapters, which are meant to boost your self-growth, productivity and happiness. They are attitude, bafflement, contemplati Wise, beautiful and eye-opening. Will re-read. It's composed of 26 chapters, which are meant to boost your self-growth, productivity and happiness. They are attitude, bafflement, contemplation, diligence, equilibrium, frugality, gratitude, harmony, insight, justice, kindness, leadership, meditation, networking, outlook, power, quest, refusal, sensitivity, temerity, unity, vision, wellbeing, x-factor, you, zeal. My favourite one is "Equilibrium" where is implied that your problems are your teachers and the way you solve and deal with them defines to some extent who you are. I couldn't agree more with that. "Remember, that adversity is one of the wisest mentors." A bold lesson is to try to see just the strengths and best qualities in everyone no matter what their flaws and weaknesses are. It's a short book, but I took my time with it and thought about it long after I read it. It's quite aligned with my own understandings about different things that it felt like chatting with a friend. Salma Farook has a vibrant and artistic style of writing. She has shared a lot of stories from her childhood, medical background and personal life. Her book is hearty, cheery and full of energy. What I missed is a little more depth although I do realise that would have made the book significantly larger. There is a certain amount of magic around its volume right now. I was given this Ebook, in exchange for an honest review. From Authors Notes "We started with reconnecting with the inner child in ourselves and the benefits of feeling lost. We trekked through different aspects of positive living ranging from forgiveness to resilience and cumulatively landed on setting concrete life goals". This little self help book is remarkably well set out. The author, herself, has stuck to a universal language that I feel even YA's can pick up and not get confused on. Althou I was given this Ebook, in exchange for an honest review. This little self help book is remarkably well set out. The author, herself, has stuck to a universal language that I feel even YA's can pick up and not get confused on. Although it draws on her own experiences, you could identify the situations with your own and agree upon them. A very chatty, friendly 98 pages. The chapters had a good feel to them. Each chapter set out where you could ponder and genuflect at the end. I took this in small doses because of this. I have read self help books before and you always hear the same messages and they conclude the same thing. It's always positive to reinforce something you already know. This comes highly recommended by me. It will suit anyone who needs a bit of an uplift, to anyone who wants to reinforce what they already know, for inspiration of any kind, to achieve life goals, to grow more confident and for anyone who wants to be more of a self balanced individual. I received an ecopy of this book from the author for an honest review. What your soul already knows is a positive self-development/ self-help book that is fast paced ( you can literally read it in one sitting), the chapters are short and the author gets to the point pretty fast. - I don’t read nonfiction, because I received an ecopy of this book from the author for an honest review. -	it think it was too positive that it was kind of unrealistic sometimes, I get it that it has to be all rainbows and sunshine but I would’ve loved to see a story of someone who had it really hard with an illness that wasn’t physical; someone who was in a really dark place and let the light shine through, someone who will inspire me and others who are dealing with mental illness, to go and find the way. -	I also think that she sometimes forgets that what is cheap to her, isn’t necessarily “cheap” for everyone else, there’s a chapter where she talks about travelling and how affordable it is and how everyone should travel more, and I honestly want to give her the benefit of the doubt and assume that plane tickets are cheap where she lives but they certainly aren’t here, or where any of my relatives and family members live. And to be honest with you that pissed me off a bit. There were other things like that but I don’t really want to get into details, because that would make this review so long and boring. I got access to the preview copy of the book through a friend. I'm so glad that I got it. This book came to me in a time when I needed it the most. It's really awesome, reflective. It it a powerful reminder for self-belief and a guide to living life fearlessly. This is a key to unlock your ultra-instinct and to become more intuitive, to be in touch with your own self that knows it all. This book has lots of good examples and metaphors that makes it easy to understand. It is both introspective and I got access to the preview copy of the book through a friend. I'm so glad that I got it. This book came to me in a time when I needed it the most. It's really awesome, reflective. It it a powerful reminder for self-belief and a guide to living life fearlessly. It is both introspective and extrospective read. It reminds me of a quote : "Intuitions are not to be ignored. They represent data processed too fast for the conscious mind to comprehend." Reading this book gave me a zen like feeling, an explorative read that made me think and contemplate, I feel a stronger connection and trust on my intuition than before. This will always be book I would come and read again multiple times. This book could have easily been extended to 500-1000 pages or so with the same information, but the best thing about this book is condensed to less than 117 pages sticking to core-points making it easy to read for me personally and to spend lesser time reading and more time contemplating. Intuition is whisper of the soul. When your intuition is roaring loud follow it. "The things that take you to success are simple. It's easy to overlook them because they seem insignificant. They're just little things you do every day that nobody else even notices.They are things that are so simple to do - yet successful people actually do them, while unsuccessful people only look at them and don't take action." Intuition is supra-logic that cuts out all the routine processes of thought and leaps straight from the problem to the answer. People may not tell you how they feel about you, but they always show you. Pay attention. Trust your intuition. You don't need to explain or justify your feelings to anyone, just trust your own inner guidance, it knows best. "The secrets to joy, aren't secrets at all. They aren't being whispered. You are just not listening loudly enough to the wisdom of your inner voice." "It is truly ironic that a four-hundred tonne aluminium monster floats so effortlessly through the sky, and only the five-year old thinks to say, 'Wow!'" "When we pause to contemplate, all of our problems are simply our privileges in disguise." "The good news is, no one ever found anything truly amazing without searching. It is the lost who wander, and only the wanderers discover new shores." "You stopped out of fear, or the subconscious assumption that you are immortal, that there will always be time. You promised yourself; Later." And there are more, but I can't share it all here. "There is nothing more soul-affirming than wandering through this incredible world. This book was absolutely fascinating, every single word stirring a different kind of emotion and inspiring in their pursuit. in the quest of becoming one’s true self. which was very much effective. One should read books like this attentively and focus on every single aspects before finalizing their own ideas and thoughts. Author Salma Farook has done an outstanding job in explaining all the simplest yet most importantly effective factor so elegantly, there’s just no point in arguing that this book, indeed is one of the best self-help book I’ve ever come across. and most importantly to cherish humanity in it’s essence. all about the truth and the very real basic facts. It holds the power to move anyone without any hesitation. This is definitely a 5+ Shining Stars read for me. Thank you Dr. Salma Farook for sending me a copy of the book for an honest review! The book is highly inspirational and a well-deserved 3.5 🌟s! The cover and the title are great! I love how the book is really talking about what our souls already know but just need a gentle reminder of, and it’s cool to arrange the qualities from A to Z. I enjoy reading Power , Vision and Meditation in particular! I also agree with Unity that it is wise to keep our circle small, and that a handful great fri Thank you Dr. Salma Farook for sending me a copy of the book for an honest review! The book is highly inspirational and a well-deserved 3.5 🌟s! The cover and the title are great! 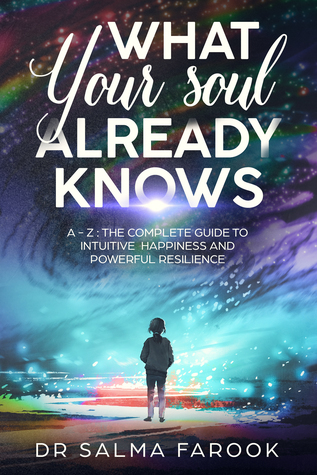 I love how the book is really talking about what our souls already know but just need a gentle reminder of, and it’s cool to arrange the qualities from A to Z. I enjoy reading Power , Vision and Meditation in particular! I also agree with Unity that it is wise to keep our circle small, and that a handful great friends are more valuable than a room full of jolly acquaintances. The following would be some of my favorite quotes! “It is truly ironic that a four-hundred tonne aluminium monster floats so effortlessly through the sky, and only the five-year-old thinks to say, 'Wow!'" But of course there are things to be improved. Some headings and the description don’t match. Examples include Diligence with a passage talking about friends and mentors, Insight about perfection, and Justice about forgiveness. It is cool to have qualities starting from A to Z, but the content should match the heading! Moreover, I wish to read more personal experiences! I love your experience with your husband’s grandmother as well as your friend with a sick mother. These stories help to make the vague qualities concrete and valid. I would love to read more regarding your medical path (since I'm working towards becoming a doctor myself :D), or your patients' stories. I was provided a free copy of What Your Soul Already Know by the author in exchange for an honest review. I thought What Your Soul Already Knows was a decent introduction to self-help and spirituality; it wasn't necessarily for me, as I have done a lot of work in that vein. However, I thought there were some really bright parts of What Your Soul Already Know, I particularly liked the setup, the ABCs of personal development/self-help. My favorite chapters were Meditation and You. I wished they wer I was provided a free copy of What Your Soul Already Know by the author in exchange for an honest review. However, I thought there were some really bright parts of What Your Soul Already Know, I particularly liked the setup, the ABCs of personal development/self-help. My favorite chapters were Meditation and You. I wished they were both longer. I had a major with the chapter Frugality, not that there is an issue with being frugal or grateful for what you have, but there is one sentence in which Farook says, "You are too blessed to be sad." Being socioeconomically stable or privileged is a blessing, it gives individuals advantages that they should be grateful for, and gratitude helps one keep perspective, but it does not prevent someone from being sad, nor should it be used to invalidate their sadness. I also had some issues with this particular line in the chapter X-Factor, "The simple truth is that even across this varied palette one law remains universal; People, all people, love to be individualized." It reminded me of Jane Austen's, “It is a truth universally acknowledged, that a single man in possession of a good fortune, must be in want of a wife,” which, in all of my academic conversations, has resulted in the question, "Says who?" (And is the point). I don't believe universality can be declared so flippantly.
" It is the lost who wander and only the wanderers discovers new shores." So this is my second self help read of the year and I'm amazed that how easily I was able to read the book and get inspired from it. This is another great self help book written by Dr. Salma Farook which is based on various qualities which we should inculcate in our daily lives. It's a very short read but the chapters will leave an impact on you and leave you with positivity and motivation. An A to Z guide to finding and nurturing that inner happiness and peace that you’ve always wanted.
" We are so focused on everything that is wrong or unsatisfactory that we forget to list all the tiny things that are perfect." The chapters are divided into 26 chapters each containing a short story or a motivational piece of writing. The language is easy and understandable. This is a book that hits the right marks and only one read will never be enough, because people tend to forget even the little things they actually know deep inside. I would definitely recommend all to give this book a try and I'm sure you'll never regret. The author tries to provide her insight on living a comprehensive, healthy and fulfilling life. She throws light on some of the life events that made her contemplate on her inner self and well -being. The book is her effort to connect with the people of the mechanized world system who are moving away from the knowledge that their soul already knows – “the natural balance of joy and productivity”. Some of the themes discussed like contemplation, attitude, frugality and sensitivity had positive me The author tries to provide her insight on living a comprehensive, healthy and fulfilling life. She throws light on some of the life events that made her contemplate on her inner self and well -being. The book is her effort to connect with the people of the mechanized world system who are moving away from the knowledge that their soul already knows – “the natural balance of joy and productivity”. Some of the themes discussed like contemplation, attitude, frugality and sensitivity had positive messages for the reader to help spread an optimistic outlook towards life. To value time and make this life worthwhile - that is not a secret method but something that our souls already know. The narration of the chapters were simple and flowing. The book was concise, around 110 pages long that can be completed in a single sitting. I liked the book cover that could capture the subject matter. So, my final verdict is that if you are looking for a light read with some strong messages, do give this book a chance. To be honest, i never read any self help book ever in my life but i find myself reading this book very enjoyable. The main points of this book revolves around finding true happiness and self development in a very engaging and relatable manner as well as on a personal level from the author's experiences that makes readers contemplate and reflect on their life. "You are not an ocean. You are not infinite, but with regular rejunevation, you can be." -What Your Souls Already Know. I received a copy of this book from the author. I had some reservations because I generally feel a little pressured to give a resounding review to a book when I receive it from the author. I am happy to report, this book is actually really good. Even though it is a short read, it packs so many valuable information. The book offers 23 ways to get to happiness, of them, as the title suggests, your soul already knows, others, it might be new to. The author offers practical steps on a wide range of I received a copy of this book from the author. I had some reservations because I generally feel a little pressured to give a resounding review to a book when I receive it from the author. I am happy to report, this book is actually really good. Even though it is a short read, it packs so many valuable information. The book offers 23 ways to get to happiness, of them, as the title suggests, your soul already knows, others, it might be new to. The author offers practical steps on a wide range of topics including your finances, your happiness, relationships and health. I love how simple but impactful this book was. This is definitely a book I will be re-reading during the course of the year. This was simply lovely. So thoughtfully written and inspiring. I loved every little chapter. Definitely something I need to re-read when my soul forgets what it already knows again (especially the “Refusal” and “Temerity” chapters). Although adept at observing tiny quirks in people and fascinated with the mechanics of human relationships, she regularly pushes doors that very clearly say PULL. I got a preview copy of this book. What are the little things we could do that make huge changes in our happiness? 26 lovely answers, in alphabetical order! Will be reading this again! First of all, I'd like to thank the author Salma Farook for giving me a copy of this book to read. In the beginning I had mixed feelings First of all, I'd like to thank the author Salma Farook for giving me a copy of this book to read. In the beginning I had mixed feelings toward the book, it started as a totally anew experience since I had in the back of my mind the fact that this was a gift like no other, but as i got through the pages of the book I simply relaxed and let the words sink in. If I were to summarize it in a few words, I'd say that this is a book that hits the right marks and only one read will never be enough, because people tend to forget even the little things they actually know deep inside, so this book is actually a good reminder of all the things we might overlook from time to time, because we get swept in daily activities, stress and all other external factors. The book has a lot to offer, even thus it treats subjects we already know, Salma Farook lays down everything in a simple and beautiful writing style that captivates the reader from the first page, it has such a endearing approach without any theoretical terms, unlike many of the similar books from the genre, the words are simple, understandable and she always uses examples or life experiences to make us understand the exact message. Moreover, every "chapter" starts with a quote, which I totally loved! It shows the caring and research done in order to reflect the exact feeling. Because of the way it's written, I felt that the author manages to create a bond between the reader and the book. Precisely because of this reason I found myself in a dilemma on how I could rate it. Finally I believe that this is the type of book that one either likes or finds it similar with so many others and so, the rating is very subjective depending on the reader. In my case it's quite simple, the content presents things I already know, but are remarkably written and it provides also advice on how we should act in our life journey. There are things that we usually forget/ignore or simply brush aside, the fact that are written down is a good reminder and one that we should review it from time to time when we feel like we're buried with worry or stress. This book helps a person grow, bloom and become someone better as long as there's a will to change the negative sides from our lives in something positive. I was more used to the theoretical type and so, when I started reading it in the beginning I felt it was more like a journal, like notes or like talking to a dear friend about life and getting advice, precisely for this reason I found it so useful in the end. Simply said, the title actually says everything about the book and so, becomes the perfect summary. I can only thank Salma Farook once more for this opportunity to add to my collection a remarkable book. 👍 First of all I would like to thank the author @salma.farook for such an amazing self help book that reached me at a time when I most needed it. 👍 This book is well planned and well composed. I love how it is well edited (it matters a lot and it makes a lot of difference). 👍 The whole book is divided into 26 well concised chapters with each chapter aptly named and each chapter starting with a perfect quote telling the reader what each chapter is going to be about. 👍 Each chapter is perfect (no exaggeration here). There is no beating around the bush. Well thought examples have been inserted only in chapters where they fit. 👍 My favorite chapters were on Power & You. Because I feel these two chapters as the most important in this book that we all need to focus on. 👍 Overall this was such a good read. It will take at the most one or two hours to read this beautiful book. 👌 Bonus : There's a book of poetry coming from the author called 'The Octopus Curse' with excerpts at the end 👎 There is nothing that comes to my mind when I think about what more to add /suggest to make this book better. But I would say that most of the things that are mentioned in this book is not that much different from other self help books. I would love to read a self help book that is written in a way that I can find that the book is totally different/unique from the numerous self help books available everywhere. 🌡️ Do I recommend it? : Yes, I do recommend it to everyone. Young and old. "It is good to concentrate on the bigger picture, but it is better, to do so while taking joy in the pixels that make it up." So self help books are not really my first picks, but I am widening my horizons in the genre department. 'What your soul already knows' was my 2nd self help read and I absolutely loved it. The ebook was sent to me by the author in exchange of an honest review. The book has chapters related to all aspects of life. From gratitude, resilience to life goals and finding your inner child it has everything so beautifully wtitten. There are quotes at the beginning of every chapter which perfectly describes each chapter and gives you an insight to the content of the chapter, which is something I really liked. There wasn't one chapter that I couldn't relate to or understand. The message the author wanted to convey was loud and clear. The chapters are short and crisp and didn't drag anywhere. There are little stories incorporated in chapters which were really interesting and helfpul for the context. I really loved the story in the chapter Insight, it was such a beautiful story. This was my first self help book I’ve ever read and I’m surprised I actually like it. I hadn’t had any expectations only hope this book wouldn’t turn in something super deep and spiritual. I’m glad I was wrong. If I had to compare it with something that would be a child. It felt so genuine and written with love that you can almost feel the good vibes radiating from it. It’s like the grown up author has a hidden child soul who found how to be happy and want to share this knowledge with the world. This was my first self help book I’ve ever read and I’m surprised I actually like it. I hadn’t had any expectations only hope this book wouldn’t turn in something super deep and spiritual. I’m glad I was wrong. If I had to compare it with something that would be a child. It felt so genuine and written with love that you can almost feel the good vibes radiating from it. It’s like the grown up author has a hidden child soul who found how to be happy and want to share this knowledge with the world. It’s very touching and everyone who read it should be feeling lucky – it’s a big present nowadays someone to open up his/her heart for strangers (okk, this may sound too exaggerated but you get it…right?). Besides the worm and satisfaction, the style of the writing also contributes to the whole picture. The examples are all from personal experience and may sound very ordinary and boring, but that’s why I like it. By giving such cases Farook presents the happy life as something possible to be reached by everyone and not only hapy but also fulfilling one, without regrets. It’s worth mentioning the chapters’ division which allows the reader to take a deep breath, give the topic full consideration before moving on to the next one. Small chapter with big sories. Reading the book “What your soul already knows” by Dr . Salma Farook is like taking a dive into your own soul. You won’t discover new secrets or some breakthrough knowledge. Personally I don’t believe that these things exist. The writer is honest with you. She tells you things you already know but you have forgotten. The truth is that in this time and age we are all trying hard to deal with the hardships of life and sometimes we fail. Why is that? Because the trick to life is simple: dig into yo Reading the book “What your soul already knows” by Dr . Salma Farook is like taking a dive into your own soul. You won’t discover new secrets or some breakthrough knowledge. Personally I don’t believe that these things exist. The writer is honest with you. She tells you things you already know but you have forgotten. The truth is that in this time and age we are all trying hard to deal with the hardships of life and sometimes we fail. The book, as it says is a reminder, about everything we already know. We Know, but we fail to exercise. We know, but somewhere on the stage of life we fail to perform or perhaps we are concerned about the audience/social outcome, which in turn restricts our actions. Stopping us from doing what's right, and we do what's socially more acceptable. It's delicately crafted with apt examples, at the right places, at the right time. Ms. Farook has done a marvellous job in filling the gaps which our actio The book, as it says is a reminder, about everything we already know. We Know, but we fail to exercise. We know, but somewhere on the stage of life we fail to perform or perhaps we are concerned about the audience/social outcome, which in turn restricts our actions. Stopping us from doing what's right, and we do what's socially more acceptable. Ms. Farook has done a marvellous job in filling the gaps which our actions create with her words. You could simply start reading the book from any page and still find yourself connected to it. You would find yourself familiar with the order of the words, the message they are trying to convey. But how you feel when you read it, shall be entirely yours to claim. The book is filled with positivity! "Maybe when we are learned enough in the illiteracy of childhood, we can finally pacify the world." "As I sit on the shore, the waves caressing my feet, I realise in a moment of absolute lucidity, that I am... happy." What an incredible book!! I am on a bit of a high after reading it. Dr Salma Faro has such a beautiful gift! I’m so grateful to her (and to her encouraging husband) for following inspiration, for this book is inspired. It is full of reminders of all we have to be grateful for and that we can rejoice in all circumstances. We can find peace and even joy in ALL we experience, the great and even those experiences we may view as not so great. We can be happy because of them, not in spite of them. Can What an incredible book!! I am on a bit of a high after reading it. Dr Salma Faro has such a beautiful gift! I’m so grateful to her (and to her encouraging husband) for following inspiration, for this book is inspired. It is full of reminders of all we have to be grateful for and that we can rejoice in all circumstances. We can find peace and even joy in ALL we experience, the great and even those experiences we may view as not so great. We can be happy because of them, not in spite of them. Can you image? Knowing the secrets to finding joy no matter what? She shares several ways in this book and she does it all so poetically! I recommend reading this book once from start to finish and then going back and picking a section at random to read as a daily meditation. Then get a copy and share it with your friends! Let’s spread the joy!! An extremely well written book. If you guys have been following me for a while, then you already know that I love self help books. But this is one of those books that everyone must read. The book has chapters titled from A to Z with real life examples and amazing quotes all up-to the point. Which means you are really gonna takeaway many things from this book. The personal examples by the author just made everything more relatable and touched my heart. The chapters are small and I couldn't believ An extremely well written book. If you guys have been following me for a while, then you already know that I love self help books. The chapters are small and I couldn't believe that I was flipping through the pages so fast. If you are looking for a book that will fill you with positivity and motivation in the end, then this is it. It is going to make you stop and think, re-evaluate your decisions and help you know your values better and find your goals. This short book was timely for me because it reminded me of the important things in life at a period when I was feeling stressed and down. The author has many useful life hacks that made me reflect and ponder. My favourite of these is: ‘As a dear Friend once told me, the aim is progress, not perfection. Try to be better today than yesterday. Consistent work has more power than inconsistent, immaculate work. So don’t beat yourself up the next time you don’t match up to your exacting standards.’ I found reading this passage helped me to adjust and stay resilient in the face of a new and demanding job. WYSAK is certainly worth a read when you want to slow down and think about the important things in life. I was lucky enough to receive this book free in exchange for an honest review. I figured it would be a drag. I was SO wrong. It is a short easy to read book that could be titled: “how to love your life” or “tips to be happy and whole”. I could go on! This book should be mandatory for all teens struggling with the question:”what to do with my life?” It is about focusing on what really matters in life and basic steps to become content. All of ya come to a point in our life that we struggle. This b I was lucky enough to receive this book free in exchange for an honest review. I figured it would be a drag. I was SO wrong. It is a short easy to read book that could be titled: “how to love your life” or “tips to be happy and whole”. I could go on! This book should be mandatory for all teens struggling with the question:”what to do with my life?” It is about focusing on what really matters in life and basic steps to become content. The best! I never thought I would complete a philosophy or self help book cover to cover, but once I started reading the early copy of this book, it was definitely a page turner. Short stories, inspiring little words, not too long or complicated to pause and come back again. Great work by the author. Loved it. Salma Farook was born in Seychelles to two ‘very Indian’ parents. She grew up on the islands and went on to complete Med-school in India. She believes the scenic beauty of the Seychelles and the cultural impact of one of the world’s oldest civilisations gave her the best of both worlds. Although adept at observing tiny quirks in people and fascinated with the mechanics of human relationships, she Salma Farook was born in Seychelles to two ‘very Indian’ parents. She grew up on the islands and went on to complete Med-school in India. She believes the scenic beauty of the Seychelles and the cultural impact of one of the world’s oldest civilisations gave her the best of both worlds.